With the lead single "Smells Like Teen Spirit" from the band's second album Nevermind (1991), Nirvana entered into the mainstream, bringing along with it a subgenre of alternative rock called grunge. 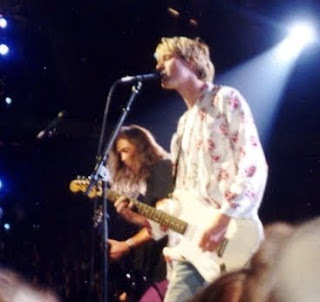 Other Seattle grunge bands such as Alice in Chains, Pearl Jam, and Soundgarden had also gained popularity, and as a result, alternative rock in general became a dominant genre on radio and music television in the United States during the early-to-mid-1990s. As Nirvana's frontman, Kurt Cobain found himself referred to in the media as the "spokesman of a generation," with Nirvana being considered the "flagship band" of Generation X. Cobain was uncomfortable with the attention and placed his focus on the band's music, believing the band's message and artistic vision to have been misinterpreted by the public, challenging the band's audience with its third studio album In Utero (1993). Nirvana's brief run ended with Cobain's death in April 1994, but the band's popularity continued in the years that followed. In 2002, "You Know You're Right," an unfinished demo from the band's final recording session, topped radio playlists around the world. Since their debut, the band has sold over twenty-five million albums in the US alone, and over fifty million worldwide.